The marketing department at Nintendo has been working overtime to come up with a way to get more Wii U consoles shifted. At the end of last week we reported on Nintendo UK meeting with worried retailers and that Big N had a plan, even a vision, to present to retailers “in the coming weeks” with a strategy to help build “Wii U momentum over the course of 2013”. Now, with the image of this new marketing flyer on the screen in front of me, I am imagining someone in the Nintendo marketing department piped up in a meeting to say “I know, let’s print a flyer” and without any better ideas being volunteered, this got produced. Take a gander at it below. 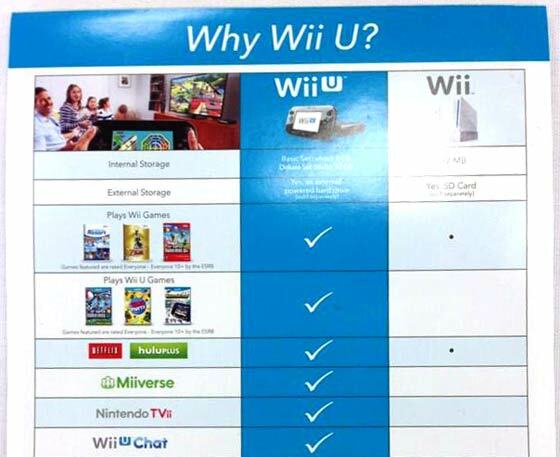 The flyer is entitled “Why Wii U?” and is in the form of a checklist comparing the Wii U and Wii consoles. All the features of the Wii U are listed with a big tick. If the Wii shares the highlighted feature, there’s a tiny dot to denote that, otherwise the comparison check box is left blank. Geoff Keighley of GameSlice.com picked up the flyer from a retailer at the weekend and commented, via his Twitter account, that he was “speechless”. So how does the new Nintendo flyer/poster sell people on the idea that buying a Wii U may be a better thing than buying a much cheaper Wii console? It doesn’t really, and that’s the point and why Keighley, above, was speechless. Oddly placed, almost near the bottom of the list Nintendo has decided to mention the HD graphics capability/support built into the Wii U. Aren’t better graphics one of the major reasons people upgrade to new consoles? Especially as compared with the Wii’s contemporary competition, graphics were a weak point. Overall, this poster/flyer looks ill conceived and badly executed. Agree with the writer, badly conceived and executed. If they want to drive interest they need to do better than showing their console as being a worth while upgrade from the older version. Trying to continue the Wii ‘brand’ seems to have backfired on them enormously. They simply didn't do enough at the start to differentiate it as a new console; similar name to the Wii, similar hardware design, same crap marketing and advertising. 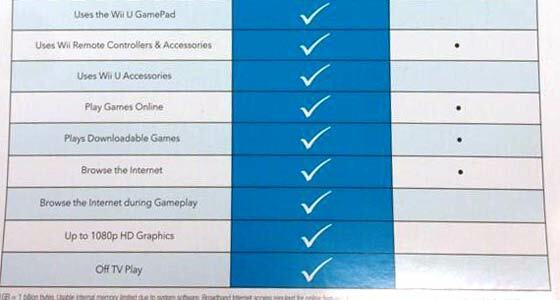 Their adverts plainly stating “It's a new console!” and now this, it smacks of Nintendo desperately trying to make people realise it's not just an upgraded Wii, but doing a comparison like the above almost has the opposite effect for me. The console can't do enough on its own to stand out so Nintendo has to point out the differences for you. Advertising student here, trying not to kill myself. Just die already Nintendo. You have used up all your lives. Game over. What have their 5000+ employees done to hurt you?? You want them to lose their jobs?? Really now?? How would you like if someone wished the company you worked for, or a business you started would go bankrupt,so you could be left unemployed? ?